Some of the bosses in Adventure Bar Story can be a little tricky to find. Let's look at Ottssie and Mad Ottssie today. Can you see the sparkle? It is just a couple of steps in front of Siela. 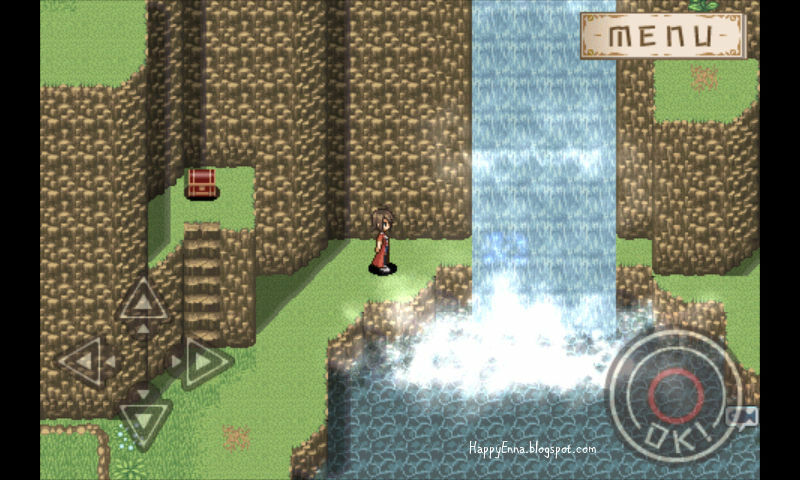 There is a cave behind the waterfall. Ottssie hides in the end of the cave. Ottssie has strong resistance to ice, earth, poison, blind, silent and paralyze element. Its weakness is fire element. After the fight with Ottssie in Otts Fall / Lake, Ottssie got hurt and ran away. You'll hear from a customer talking about Ottssie being injured but still around. After that, you'll find the Mad Ottssie here in Otts Cave. Mad Ottssie drops and item called Bearok. It is one of the essential items for Siela's Bear Outfit. :) I found you! :D Cute blog Enna! what is the best dish for leveling up? I don't think there is a "best" dish. Dishes that give lots of experience tend to be hard to get. Material dropped by drakes give pretty good experience. I used a lot of those in the late game. BTW, your blog was nice and helpful. Mm..could you recommend me the game as like as ABS, please? So have you found games that are similar to ABS? :D im waiting! How i can buy full version but i don't have a credits card and debit card.! What i can buy version with my pulsa or card phone. ?